If you live on Long Island or anywhere else in the New York Metropolitan area with open space, there’s a really good chance that you have easy access to a great venue for a summer party. It’s an outdoor space that can be adapted to your needs and best of all, it won’t cost you a thing! It’s your backyard and it’s a wonderful venue for your summer party. Whether you’re celebrating a birthday, throwing your annual barbecue or planning to hold one last summer bash on Labor Day weekend, backyard parties are the best. At NY Party Works, we’ve helped people plan all sorts of celebrations since 1993. And a lot of them have taken place right in our customers’ backyards. You can be hosting a party for your kid, backyard movie night or a formal affair, and we have the products and services to make your backyard the ultimate party venue. Very often when we host backyard parties, it’s to benefit our younger customers. 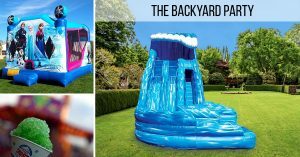 Whether you’re hosting a child’s birthday party, having a spectacular send-off or return from summer camp or a backyard sleepover, NY Party Works has some of the best inflatables you can find for your party. We have bouncers such as our 20 X 20 Castle which is great for kids of all ages. Kids can have fun taking over the kingdom while parents can monitor what’s going on inside through the semitransparent windows. If you have more limited space we also have 15 X 15 Bouncers available. We also have bouncers which allow for multiple activities. You can be a superhero like Wonder Woman or Batman with our Justice League Combo or enjoy the winter world of Elsa and Anna with our Frozen Combo. Summer time is a great time for water slides and NY Party Works has them with our 18 foot waterfall slide or our 22 foot long Mungo Water Slide. If you’d like to stay on dry land, you can do it in a big way with NY Party Works’ 24 foot Patriotic Double Lane Slide. You can also make it a movie night. Turn your backyard into a drive-in theater with our Inflatable Drive-In Screen. There’s nothing quite like seeing a movie under the stars. We’ll provide you with a 16’ by 9’ viewing screen. projector and speakers. You give us the movie. We can also connect the screen to PlayStation and Xbox games. And what’s a movie without popcorn? NY Party Works has you covered there with our popcorn cart and popcorn machine. Whatever type of party you may be planning in your yard, NY Party Works can make it easier for you. You won’t have to worry about the weather if you rent a tent from us. We have packages that include tents and our inflatables as well as food concession rentals. We can rent you a 20 X 20 tent as part of the package for your summer party and we can also accommodate bigger and smaller yards with a 20 X 60 tent, a 20 x 20 tent or a 15 X15 tent. NY Party Works can also provide you with chairs and your choice of round or rectangular tables. As always, we can help you put together the entire backyard party with total event planning. There are many events in the summer worth celebrating. NY Party Works can turn your patch of grass into a backyard party paradise. Whatever your celebration is and whatever theme you’re planning we can make it memorable. Contact NY Party Works today.